A group of devoted hikers is hauling bricks up the steep trail to rebuild crumbling steps. Now they want the city to help. 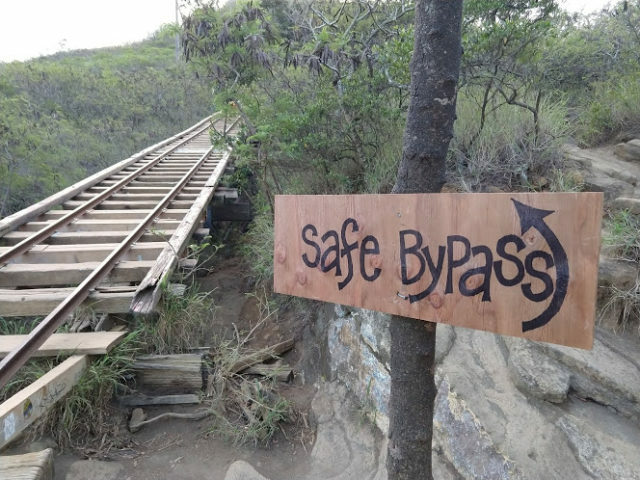 A group of Hawaii residents who regularly hike Koko Crater Railway Trail have banded together to save the heavily trafficked Hawaii Kai hike from erosion. If no repairs are made, they fear the city will eventually shut down the trail. The trail follows a now-defunct tramway which is deteriorating as thousands of tourists and residents hike up and down it every week. Drew Murphy belongs to a subculture of Hawaii hikers devoted to the Koko Crater trail. He estimates there are more than 400 people in the group, who have dubbed themselves “kokonuts.” Four months ago about a third of them created the Kokonut Koalition to advocate for city repairs. 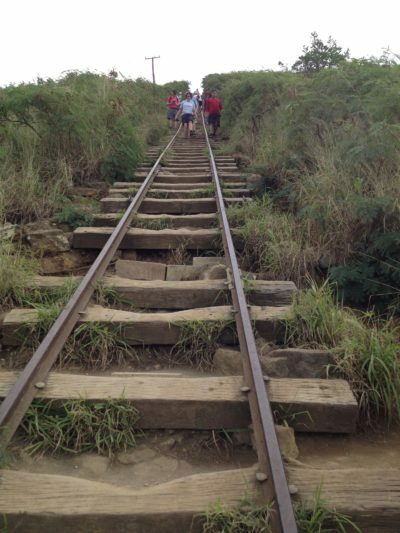 Built in 1942-43, wooden beams used as steps on the Koko Crater Railway Trail are rotting. Lane, which started out as a Category 5 hurricane and weakened to a tropical storm, came close to hitting Oahu last week. Some of the roughly 1,048 wooden ties built into the crater’s south side, which create steps for hikers, are rotting and some have slid off the rail. To avoid the shaky steps, hikers sometimes walk on the dirt around the wooden ties, but the foot traffic has created shallow gullies around the rail. The U.S. Army built the tramway 75 years ago as part of the Koko Crater radar station, which sits at the top of the crater and now serves as a lookout for hikers. Similar to the Lanikai Pillbox hike and Haiku Stairs (also known as the “Stairway to Heaven,”) Koko Crater trail is one of a number of abandoned military installments on Oahu that have turned into popular hikes and cause headaches for public officials because of safety and liability concerns. There are about 1,048 steps to the top of Koko Crater. In a 2014 Civil Beat column, then-city spokesman Jesse Broder Van Dyke said the city doesn’t encourage the trail’s use. Aside from removing a beehive in 2014, the city doesn’t maintain the Koko Crater trail, said Nathan Serota, spokesman for the Department of Parks and Recreation. Still, Serota said in an email that the parks department is open to working with community groups to improve parks. Officials with the parks department, which has jurisdiction over the trail, plan to meet with Kokonut Koalition members and Councilman Trevor Ozawa, who represents Hawaii Kai, this week. Jane Howard, vice president of the Kokonut Koalition, estimates about 1,000 people use the trail daily and tourists now outnumber locals. Some days, she said she has seen sports teams and groups of soldiers bused to Koko Head District Park to trek up the crater. “We’re all very concerned that if there isn’t something done in a reasonable amount of time then there won’t be a Koko Crater trail anymore,” said Howard, who hikes the trail three to four times a week. Murphy thinks the the city should replace the wooden railroad ties, helicopter in gravel to prop up the tramway and create a system to divert rainwater. That, he said, should be the “bare minimum” the city does to repair the hike. The city of Colorado Springs, Colorado, created the Manitou Incline, a trail formerly used as a cable car system, which Murphy said could serve as a model for Honolulu. Colorado Springs spent about $5 million for the rail-to-trail conversion; $2 million came from the U.S. Department of Housing and Urban Development’s Community Development Block Grant, the Colorado Springs Gazette reported. Tommy Waters, who is running against Ozawa for the council seat in the November general election, said he supports upgrading the trail. City construction projects typically require the council to allocate money and the city to put out bids for the project. Larger projects sometimes require environmental assessments. The whole process can take years. Rather than wait, Howard, the coalition vice president, wants the city to allow volunteers to repair the trail on their own in the meantime. Even without permission, people have hauled a hodgepodge of materials including new wooden beams, cement, sand and dirt to rebuild or fortify the crumbling steps, Howard said. In May, she joined a group who hauled cement blocks up the trail to build a series of steps. Within two days, someone had thrown the cement blocks off the trail but in the weeks that followed, hikers relocated them to re-create the steps.